Today is Winter Solstice, and very thankfully, from now on the days will be getting longer. It can be a grey, damp and drear time of year, but Winter Solstice gives you something to look forward to if you are a gardener. The story of solstice celebrations goes back to the Celts, who didn’t really understand about astronomy, yet the Druids did. So the Druids, wanting to keep the power over the people, when the people were scared because the light in the sky was waning, said they could help them out. On the solstice, the Druids would go up to the top of a mountain and set a tree on fire (which is where we get the Christmas tree with lights motif), and then after this ceremony the people noticed that the days started to get longer, and thus they were happy, the Druids were happy (and sneaky), and the days got longer. We celebrate a gardener’s solstice with greenery adorning the house, and a dinner of Northwest bounty, featuring a wonderful Louisiana gumbo with Dungeness crab and shrimp. Good times! My Jasminium nudifolium, or winter jasmine, despite the frigid temperatures started to bloom today! The bright yellow tubular flowers stand out against a grey December sky, and they are a favorite with the hummingbirds that winter over in my garden. It is a shrubby vine, so it does need a bit of space, but looks wonderful with a rock wall as a backdrop. It does not have the fragrance that summer-blooming jasmine does. It looks good underplanted with snowdrops and grape hyacinth. Very easy to grow, and blooms during the bleakest time of year–I love this plant! Try it in your garden! During this cold weather you will want to take a few steps to keep your feathered friends well fed. First, it helps if you know what types of birds are coming to your garden, so you then can determine what types of foods they like to eat. If you can describe the bird, you can set a search engine to “images,” and then type in your description–this is a quick way to figure it out. Bird identification books suited to our area can also help–check the library for these. Once you’ve identified the birds, then figure out what they like to eat. I serve a few different types of foods for the birds that show up here. In general, many types of birds really like black oil sunflower seeds with the shells on. Although the books recommend millet, I have found that the birds that frequent my feeders tend to toss it to the ground in search of tastier sunflower seeds, and the millet grows an awful invasive grass that is a pain to keep weeded, so I no longer serve millet. I do serve suet as well–this will attract many birds. I use a storebought suet that does not melt in the summertime that has peanuts in it, and the birds really seem to enjoy it. I also have put out niger thistle seed, as a few birds will eat it–again, do be careful with it and don’t spill it on the ground–it forms another awful invasive weed that you do not want in your garden. The best local source I have found for all manner of bird foods, as well as a great assortment of materials for making garden fertilizers, is a store in Portland, Oregon called Concentrates, Inc. They have a large variety of seeds and the best prices in town. They are getting ready to move to a new location, so give them a call before you visit them for updated location information. Types of feeders that I use varies. My better half made me a great tray feeder with a roof out of scrap wood that works very well, and I keep this one stocked with sunflower seeds. It has a roof but is open on both sides, so the little birds can fly in and out of either side, and they like that. Feeders with roofs keep the seed dry in the rain, so look for that. A metal tube feeder works well for serving thistle. I’ll have more on hummingbird feeders and feeding following. You can make your own feeders–there are a wide variety of designs available online and in books, or you can find good ones for purchase. Placement of the feeders should be near a tree or shrub that will provide the birds with protection. They like to eat a bit and then retreat to shelter, so plan accordingly. Water is important in the wintertime. Normally there is rain, so nature takes care of it for you, but when it’s frozen out, it can be hard for birds to find enough moisture, so if you can provide them with even a small container of warm water, it will be appreciated. There are heaters that you can place in bird baths that keep the water unfrozen; I have not experimented with those yet, but many find them effective. A garden for the birds is easy to create. Some people forgo the work of the feeders and simply plant a garden that provides the birds with what they need. Make sure to include shrubs and trees to provide shelter, and many plants that provide food. Make water available, either naturally with creeks or streams, or with bird baths. I leave many annuals and perennials uncut in the fall to provide the birds with seeds. Bird gardens should never use pesticides, because it will harm the birds–the birds will eat a lot of the bugs, anyway. Hummingbird feeding in the winter is possible, but must be regularly adhered to or the birds will suffer from lack of care. Right now I have two male Anna’s hummingbirds that are wintering over in the garden. I have provided them shelter with arbovitae shrubs, which they like to nest in. In freezing weather, keeping the feeder going can be challenging, but possible. I usually put the feeder out during the day, and if it’s really cold–below freezing–I will warm the nectar a bit on the stove before filling the feeder. I bring the feeder in overnight so it doesn’t freeze over. The best feeder I have found is Dr. JB’s Hummingbird feeder, because it has a wide mouth that makes it easy to clean, and it should be cleaned 2-3 times per week. It is also made from durable glass. I also grow a lot of plants that flower over the winter that provide food for the hummers. Viburnum rank very high on their favorite food list, as does flowers on ‘Tuscan Blue’ rosemary. Flowering quince bloom later and are also good. Jasminium nudifolium, or winter jasmine, is a great garden addition. 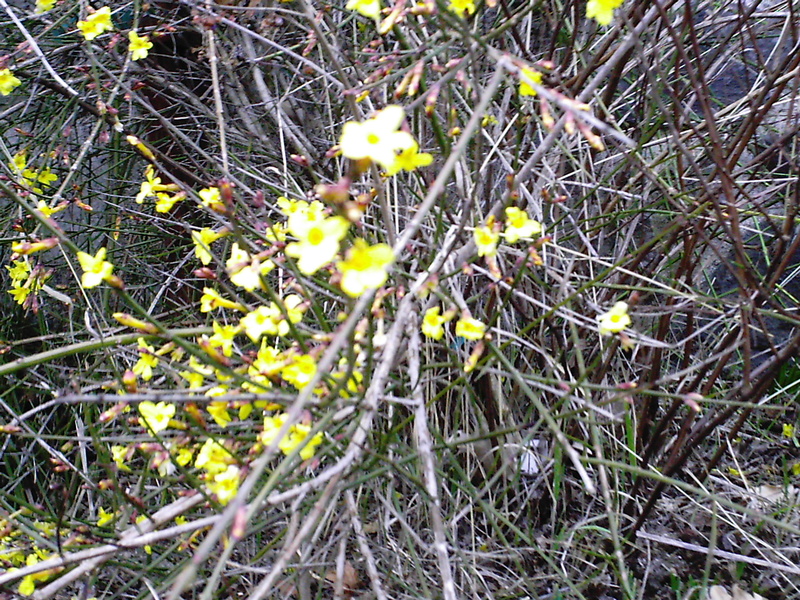 A very shrubby vine, it flowers bright yellow in the dark winter months. Glossy abelia flowers off and on all year, including the wintertime. If you provide them with year-round shelter, food and water, they will stay in your garden year round. And it is worth repeating that if you are not prepared to do the minimal but regular work required to maintain this type of feeding system, it is best to bypass it and just feed them in the summer months. These tips will get you off on the right foot with feeding the birds during the cold winter months–give it a try! I read with interest last week that the temperatures were going to drop way down (today we have a high of 25 degrees, with a whopping 16 degrees overnight), so I took a few steps to protect tender plants. –The salad greens: Under PVC pipes that make hoops over the beds, and then covered them with clear plastic, holding down the edges with bricks. Of course, it has also been very windy, so I had to modify some of the bricks with larger rocks, and that seemed to work. They’ll look a little wilted with these extreme temperatures, but should spring back when it warms up and starts raining again. –The more tender perennials: I covered my cut-back delphiniums, agapanthus and young phygellius plants with clear plastic and rocks. –Annuals that never die: I’m thinking Cerinthe major ‘Purpurescence’, which is a lovely turquoise-foliaged and purple tubular flowered beauty. I have several baby plants and a few large plants out in the garden, so I covered those as well with plastic and rock to hold it down. If last year was any indication, I will lose some of these in the more open areas, but the ones tucked in beside the house in warmer pockets should survive. I’ve had them blooming in February in some years. I had waited til the last minute to pull up the tender bulbs, but I did get the dahlias, begonias, canna and calla lilies dug up, washed off and bagged up with labels. I keep the mesh bags in which onions and oranges are often sold and use them for this purpose. For another post, but worth a quick mention now–keep your bird feeders full now, and if you can provide water, do so. The little guys, including black-capped chicadees, scrub jays and Anna’s hummingbirds that are in my garden now certainly appreciate it. Many homes in Clark County have English Laurel growing as a large hedge. It does require extensive pruning to keep it somewhat in check, but now is a great time to use some of those prunings and turn them into holiday decorations for your home. I like to use English Laurel, with its glossy leaves, as a perfect foliage foil for use in containers. These containers live outdoors year round, and I like to dress them up a bit for the winter holidays, and this laurel does the job. Just stick them in the dirt in the container in artistic clumps, add a ribbon if you wish, and you are done. English laurel is also wonderful on the mantel of the fireplace. The shiny leaves stay green for at least 3 weeks or more indoors. Pair it with some prunings from dwarf bamboo that has red foliage in the winter, and you are off to the races with natural decor that you can get for free from your abundant garden. Add some pinecones for a wonderful display of holiday cheer!